Faculty of Medicine, Universitas Islam Sumatera Utara, Medan, Indonesia. Breast cancer is a disease that afflicts women only 0.5 to 1 % are male breast cancers.Breast cancer has several variants and requires a different therapeutic approach, and until now the therapy has not been satisfactory due to the emergence of resistance. Metformin as the main choice drug type 2 diabetes mellitus which is known to have a cytotoxic effect for breast cancer. This study aimed to analyze metformin cytotoxic mechanisms covering the cell cycle , apoptosis, expression of p53, bcl-2 and cyclin D1 T47D cells which exposed to metformin HCl. The study was conducted invitro on T47D breast cancer cells which exposed to metformin concentrations of 1738.2 µg / mL and 3476.4 µg / mL and doxorubicin concentrations of 0.1µg / mL and 0.2µg / mL for 24 hours. Cell cycle testing and apoptosis using the flowsitometry method and expression test of p53 protein, bcl-2 dancycline D1 in T47D cells with immunocytochemistry. Data was analyzed by one way Anova with Bonferroni's advanced test. The results showed that metformin inhibited the G0-G1 phase of the T47D cell cycle, triggered T47D cell apoptosis, significantly reduced p53, bcl-2 and cyclin D1 protein expression (p <0.05). Conclusion of the study, metformin inhibits T47D cells through inhibition of the cell cycle G0-G1 phase, reducing protein expression p53, bcl-2 and cyclin D1. Ferlay, J. et al. Estimates of worldwide burden of cancer in 2008: GLOBOCAN 2008. Int. J. Cancer127, 2893–2917 (2010). Tao, Z. Q. et al. Breast Cancer: Epidemiology and Etiology. Cell Biochem. Biophys.72, 333–338 (2015). Moiseenko, F., Volkov, N., Bogdanov, A., Dubina, M. &Moiseyenko, V. Resistance mechanisms to drug therapy in breast cancer and other solid tumours: An opinion. F1000Research6, 288 (2017). Daugan, M., DufaÿWojcicki, A., d’Hayer, B. &Boudy, V. Metformin: An anti-diabetic drug to fight cancer. Pharmacol. Res.113, 675–685 (2016). Birsoy K, Possemato R, Lorbeer FK, Bayraktar EC, Thiru P, Yucel B, Wang T, Chen WW, Clish CB, S. D. metabolic determinants of cancer cell sensitivity to glucose limitation and biguanides. Nature508, 108–112 (2014). Lin, C. M. et al. Association between gastroenterological malignancy and diabetes mellitus and anti-diabetic therapy: A nationwide, population-based cohort study. PLoS One10, 1–11 (2015). Wheaton, W. W. et al. Metformin inhibits mitochondrial complex I of cancer cells to reduce tumourigenesis. Elife2014, 1–18 (2014). Owen, M. R., Doran, E. &Halestrap, A. P. Evidence that metformin exerts its anti-diabetic effects trough inhibition of complex 1 of the mitochondrial respiratory chain. Biochem J614, 607–614 (2000). Queiroz, E. A. I. F. et al. Metformin induces apoptosis and cell cycle arrest mediated by oxidative stress, AMPK and FOXO3a in MCF-7 breast cancer cells. PLoS One9, (2014). Wibowo, Y. C., Mahanani, M. R., Budiani, D. R. &Mudigdo, A. P0101 Metformin inhibits cyclin D1 expression in a p53-deficient colon cancer cell line in vitro. Eur. J. Cancer51, e20 (2015). Cai, X. et al. Metformin suppresses hepatocellular carcinoma cell growth through induction of cell cycle G1/G0 phase arrest and p21CIPand p27KIPexpression and downregulation of cyclin D1 in vitro and in vivo. Oncol. Rep.30, 2449–2457 (2013). Li, P., Zhao, M., Parris, A. B., Feng, X. & Yang, X. P53 is required for metformin-induced growth inhibition, senescence and apoptosis in breast cancer cells. Biochem. Biophys. Res. Commun.464, 1267–1274 (2015). Lim, L. Y., Vidnovic, N., Ellisen, L. W. & Leong, C. O. Mutant p53 mediates survival of breast cancer cells. Br. J. Cancer101, 1606–1612 (2009). The biology of cancer. J. Neonatal Nurs.13, 83–86 (2007). Scorrano, L. &Korsmeyer, S. J. Mechanisms of cytochrome c release by proapoptotic BCL-2 family members. Biochem. Biophys. Res. Commun.304, 437–444 (2003). Foster, J. S., Henley, D. C., Ahamed, S. &Wimalasena, J. Estrogens and cell-cycle regulation in breast cancer. Trends Endocrinol. Metab.12, 320–327 (2001). Matas, D. et al. Integrity of the N-terminal transcription domain of p53 is required for mutant p53 interference with drug-induced apoptosis. EMBO J.20, 4163–4172 (2001). Bergamaschi, D. et al. P53 Polymorphism Influences Response in Cancer Chemotherapy Via Modulation of P73-Dependent Apoptosis. Cancer Cell3, 387–402 (2003). Murphy, K. L., Dennis, A. P. & Rosen, J. M. A gain of function p53 mutant promotes both genomic instability and cell survival in a novel p53-null mammary epithelial cell model. FASEB J.14, 2291–2302 (2000). Rangkuti, I Y; Hasibuan, P A Z; Widyawati, T. The Cytotoxic Test of Metformin Hydrochloride to T47D Breast Cancer Cell. 10, 1–7 (2018). Hostanska K, Nisslein T, Freudenstein J, Reichling, S. R. evaluation of cell death caused by triterpene glycosides and phenolic substances from Cimicifugaracemosa Extract in Human MCF-7 breast cancer cells. 27, 1970–1975 (2004). Cho, H. S. et al. Synergistic effect of ERK inhibition on tetrandrine-induced apoptosis in A549 human lung carcinoma cells. J. Vet. Sci.10, 23–28 (2009). Nurse, P. A long twentieth century of the cell cycle and beyond. Cell100, 71–78 (2000). Ruddon, R. W. Cancer Biology. (Oxford University Press., 2007). Qu, Z. et al. In vitro and in vivo antitumoural action of metformin on hepatocellular carcinoma. Hepatol. Res.42, 922–933 (2012). Motoshima, H., Goldstein, B. J., Igata, M. & Araki, E. AMPK and cell proliferation - AMPK as a therapeutic target for atherosclerosis and cancer. J. Physiol.574, 63–71 (2006). Bruton, L., Lazo, J. S., and Parker, K. L. Goodman & Gilman’s The Pharmacological Basis of Therapeutics. (McGrawHill. Lange., 2005). Wattanapitayakul, S. K. et al. Screening of antioxidants from medicinal plants for cardioprotective effect against doxorubicin toxicity. Basic Clin. Pharmacol. Toxicol.96, 80–87 (2005). Barzegar, E. et al. Effects of berberine on proliferation, cell cycle distribution and apoptosis of human breast cancer T47D and MCF7 cell lines. Iran. J. Basic Med. Sci.18, 334–342 (2015). Sharma G, Tyagi AK, Singh RP, Chan DC & Agarwal R. Synergistic anti-cancer effect of grape seed extract and conventional cytotoxic agent doxorubicin against human breast carcinoma cells. Breast Cancer Res. Treat.85, 1–12 (2004). Du, Y. et al. Metformin inhibits histone H2B monoubiquitination and downstream gene transcription in human breast cancer cells. Oncol. Lett.8, 809–812 (2014). Haji HA, Sheibak H, Khosraavi M, A. J. The effect of metformin on the expression of caspase 3, 8, 9 and PARP-1 in human breast cancer cell line T47D. IJHS3, 147–153 (2016). Liu D, Song H, X. Y. A common gain of function of p53 cancer mutants in inducing genetic instability. 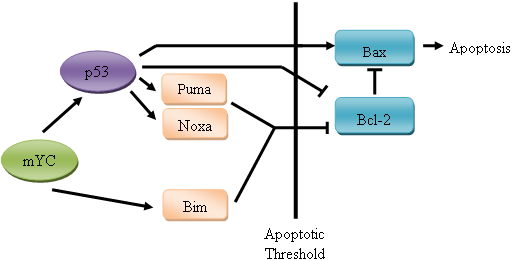 Oncogene29, 949–956 (2010). Sigal, A. & Rotter, V. Oncogenic Mutations of the p53 Tumour Suppressor: The Demons of the Guardian of the Genome. Cancer Res.60, 6788–6793 (2000). Kastan MB et al. Participation of p53 protein in the cellular response to DNA damage. Cancer Res 6304–6311. (1991). Hemann, M. T. & Lowe, S. W. The p53-Bcl-2 connection. Cell Death Differ.13, 1256–1259 (2006). Kumar, V., Abas, A. K, and Foustro, N. Pathology Basic of Disease. (2005). Biliran, H. et al. Overexpression of cyclin D1 promotes tumour cell growth and confers resistance to cisplatin-mediated apoptosis in an elastase-myc transgene-expressing pancreatic tumour cell line. Clin. Cancer Res.11, 6075–6086 (2005). Nielsen, N. H., Arnerlöv, C., Emdin, S. O. & Landberg, G. Cyclin E overexpression, a negative prognostic factor in breast cancer with strong correlation to oestrogen receptor status. Br. J. Cancer74, 874–880 (1996). Irma Yanti Rangkuti, Poppy Anjelisa Zaitun Hasibuan, Tri Widyawati, Yahwardiah Siregar, 2019.